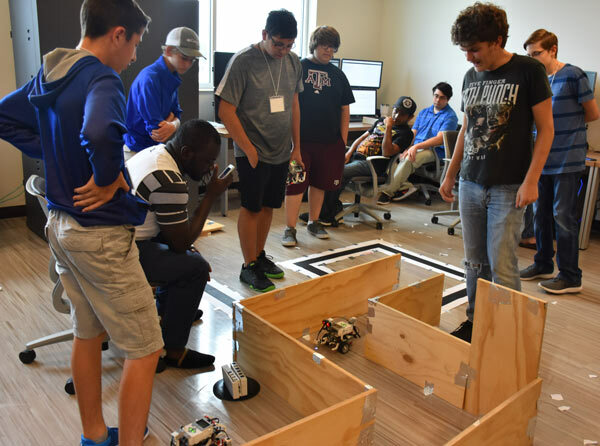 Area high school students watch a student’s robot navigate a maze after using its sensors to follow a black line across the floor in the University of Houston-Victoria’s robotics lab. Ten students from Calhoun, Edna, Industrial, Palacios, St. Joseph and Victoria West high schools attended UHV’s Robotics Summer Camp from June 25 to 29. During the camp, students learned how to build and program robots to complete tasks by using different kinds of sensors, including moving objects between two specific points, recognizing colors and solving mazes. The camp was funded by a grant from Alcoa Foundation.